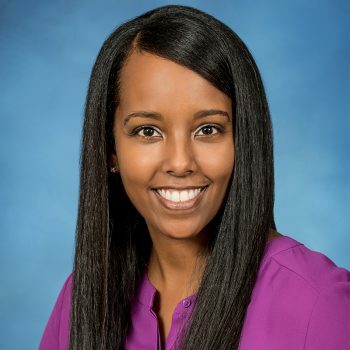 Dr. Missale Mesfin is a board-certified dermatologist and fellowship-trained Mohs surgeon with over 8 years of experience practicing both medical and cosmetic dermatology as well as performing Mohs skin cancer procedures. She is a leading provider of dermatologic care in the Virginia region and has been named a Top Doctor by Northern Virginia Magazine for four consecutive years (2014 – 2017). As a physician, Dr. Mesfin aims to provide excellent patient care, while ensuring patients are comfortable and leave their visit feeling confident in the care they received. In addition to specializing in Mohs skin cancer surgery, Dr. Mesfin also provides a variety of cosmetic treatments including Botox injections, dermal filler injections, laser treatments and sclerotherapy with more services being added in the near future. Dermatology is an exciting field of medicine because we are able to treat the areas that patients can see. It is so fulfilling to see the progress that is made and to experience a patient's satisfaction with their results. The staff was fast and professional. We were impressed with Dr. Meskin, who even called later in the day after the procedure. What a great staff and doctors! This was my 4th Mohs procedure and I cannot say enough to praise how professional, expert, competent and careful they are. Close attention to the smallest detail and obvious concern for every aspect of the patient's experience. They are so good! The only negative I can offer is that I wasn't called to come back until 45 minutes after my appointment time. Dr. Mesfin and her nurses were amazing. Extremely professional surgical team approach, which uses each staff member’s skill set. The team provides a healthy combination of medical knowledge and emotional support. Very accessible for questions and follow-up. A wonderful experience for my brave 5-year old son. Thank you so much. The entire staff was outstanding, and made me feel at ease. Thank you for all you do. “Mohs surgery in the treatment of skin cancer.” St. Vincent Health System, Continuing medical education. Erie, Pennyslvania, August 2013. “Non surgical treatments for basal cell carcinoma.” Basal Cell Nevus Syndrome Life Support Network, Regional conference. Burton, Ohio, October 2012. “Reconstruction options in Mohs surgery.” Basal Cell Nevus Syndrome Life Support Network, Regional conference. Burton, Ohio, October 2011. “Clinical Cases in Pediatric Dermatology.” Ethiopian Pediatric Society. Addis Ababa, Ethiopia, March 2011. “Dermatology of Pigmented Skin.” University of Michigan Medical School. Ann Arbor, Michigan, December 2008 and 2009. “Aging skin.” Housing Bureau for Seniors. Ann Arbor, Michigan, May 2009.